How often is it that we look to what a friend, family member, co-worker, colleague etc and pass judgement based on what they have done or sometimes by what they have not done? We look to another’s actions or lack of actions as a measuring rod with which we assess how well he/she is doing or coping or living. Dietrich Bonhoeffer advised that “we must learn to regard people less in light of what they do or omit to do, and more in the light of what they suffer.” This is sound advice. It would be fair to say to say that there are far too many times that we forget that others suffer ‘life.’ ‎The Christian discipline should be characterized by the practitioner’s ability to identify with the suffering of Jesus as it is witnessed in friend and stranger, in family and in foe. Think about how often we have said or done something that we wished we had not. Think about the circumstances of life when we have been on that place. Would it be fair to suggest that often we speak or act from the place or moment in time in which we found ourselves? Once we come to grips with the fact that our own actions and our own omissions are often driven by what is happening in our life-setting, compassion for another becomes infinitely easier as we realize that his/her actions are also born out of his/her life setting. German theologian Hermann Gunkel form criticism to redact scripture coined the phrase sitz im laben.’ This phrase roughly translated describes what occasions certain passages in the Bible were written for. The goal of looking at the sitz im labin was to deterimine what the setting in life was for the writer of a passage or what ot was for the person speaking in the text. This is useful for the redactor of scripture as he or she is able to assess what in life may have influenced the writer or speaker. The notion has now been used in other settings as well. I think of it often when thinking about how people live and move and have their being. That is to say, I am convinced that we all handle the situations that are before us based on our sit im labens. We can only respond our of our own space and place in time. Sometimes we are better equipped than others to deal with what comes down the pipes. To be able to “Sitz im Leben” is an extraordinary quality. 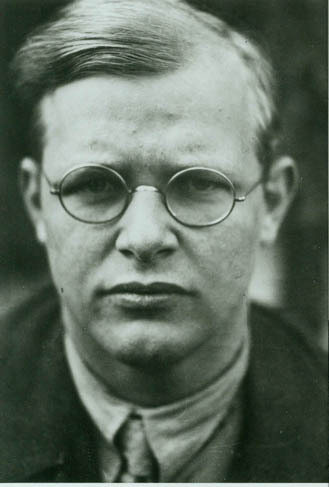 Thank you for reminding us of the heroism of Dietrich Bonhoeffer. Other ordinary people manage to “Sitz im Leben” and when we encounter that empathy we feel blessed.